TwoMorrows Publishing is a boundless resource for anyone interested in the history of superhero comic books and fandom. And comics' Bronze Age of the mid-1970s to early 1980s is the focus of the company's two most-recent books. 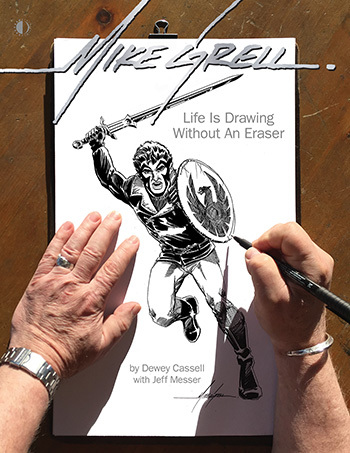 "Mike Grell: Life is Drawing Without an Eraser," by Dewey Cassell with Jeff Messer, charts the full career of one of the era's top artists, famed for his work on a range of different series published by DC. I first encountered Grell's work in 1974, early in his Legion of Superheroes run in "Superboy," and he may be the first artist I paid attention to by name. This was early in my comics-reading days and Grell's distinctive style stood out to me. I was following characters, not writers or artists, at that point, yet my path and Grell's seemed to converge frequently as we both traveled through the DC Universe. I enjoyed his work on Aquaman and Green Lantern/Green Arrow and, finally, I started collecting "Warlord," based on his writing and art. I was mostly a superhero guy, but had ventured into Conan and Tarzan at that point, and loved Grell's hollow earth, Burroughsian adventure stores. All of this work, along with Grell's brief stint illustrating the Tarzan comic strip series and some recent commission work and pin-ups is on display in this book, which is packed with black-and-white and full-color art. If you're a fan of Grell in particular, or of comic book art in general, this is a worthy book to add to your library. 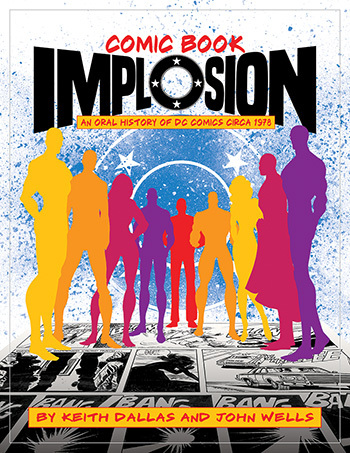 "Comic Book Implosion: An Oral History of DC Comics Circa 1978," by Keith Dallas and John Wells, meanwhile, focuses on what's often seen as embarrassing chapter of the company's history, but, in retrospect, can be seen as a story about the entire medium's survival. Like many kids of the 1960s and 70s, I discovered comics on supermarket and drugstore newsstands. Eventually, the downtown newsstand and tobacco shop, which was outfitted with two side-by-side spinner racks, became my favorite haunt. But, unknown to me at the time, buying comics in this way was quickly becoming a thing of the past. The pipe-smoking lady at the cash register in the newsstand seemed happy enough to take my dimes and quarters each week, but it turned out her boss wasn't seeing much of a profit off funnybooks. Not that he likely minded too much. He had a big shop, with space to display hundreds of different newspapers and magazines. Supermarkets and drugstores, on the other hand, had only limited room. Why fill it with cheap comics books when it could be filled with more profitable magazines? This is why DC made a bold move to both boost the price and page counts of its comics around 1978, as well as to dramatically increase the number of series it published. Dubbed the "DC Explosion," the idea was to publish comics that were both more profitable to retailers and a better value for fans. The plan failed miserably. DC reversed course almost immediately, canceling numerous titles and leaving dozens of stories unpublished. As the authors detail here in excerpts of articles and interviews from the fan press of the time and later, DC was seen as making a move to denominate the marketplace, exploit fans and lock down the industry's top creators - and it all backfired. But, as the book also makes clear, this isn't really a tale of corporate hubris, but of comics' transition from the newsstand to specialized comic book shops. It's actually the story about how comics survived, not how DC failed. As the authors note, Marvel canceled plenty of comics during this time, too, and other publishers were either drastically cutting their outputs or leaving the business. DC was just giving its best shot at keeping comic books alive as a viable presence on newsstands. It turns out that wasn't possible, at least not at the time. By focusing on comic shops, publishers could essentially print to order and target their output directly to fans. An entirely new comics explosion occured, featuring loads of new publishers and greatly expanded lines by DC and Marvel, which continues to this day. Likewise packed with photos and artwork, this book will be of interest to anyone who grew up in the era covered, or who's curious about this pivotal point comics history. TwoMorrows is a great resource for anyone interested in the world of comics, especially the Gold and Silver Age. I have been a loyal customer and have enjoyed a lot of their offerings over the years. I even had the distinct pleasure of contributing to their excellent history of Warren Pulishing, "The Warren Companion". Readers of Pop Culture Safari owe it to themselves to check out their immense catalog of comic book goodness.